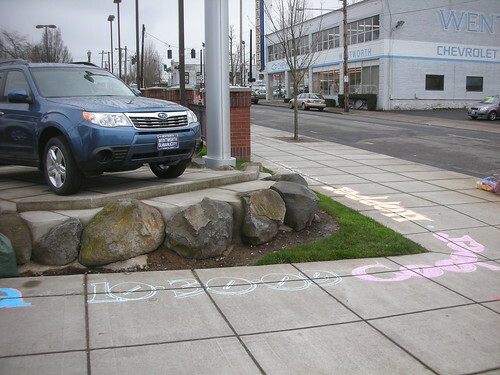 Nancy has returned to chalking on Monday mornings, 7:15am ish. 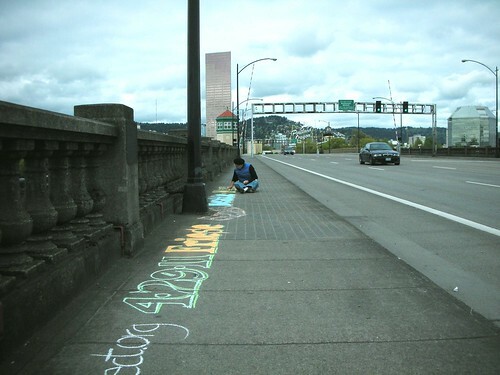 She is currently on NE Holladay near 5th Ave.
7 PM, at the First Unitarian Church, 1011 SW 12th Ave. The Veterans For Peace includes men and women veterans of all eras and duty stations including the current Iraq war as well as other conflicts. Their collective experience tells us wars are easy to start and hard to stop and that those hurt are often the innocent. Thus, other means of problem solving are necessary. 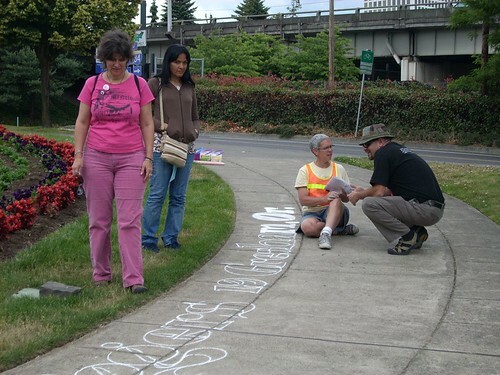 The Portland Chapter created and maintains Peace Memorial Park on the East side of the Steel Bridge. 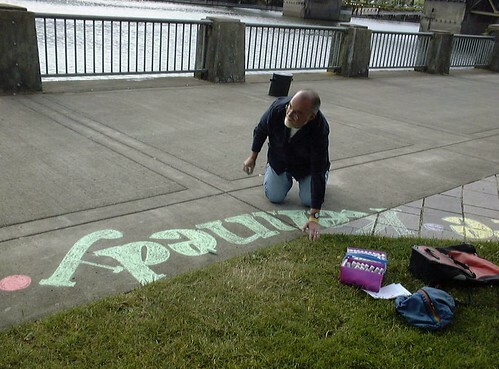 Veteran Mike Kennedy chalks his family name. When I found Nancy Saturday morning Nicky was there helping out. 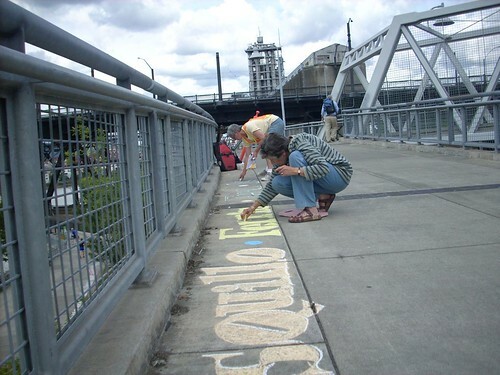 Nicky and her husband had stumbled on the Iraq Names Project a week before and stopped to help. Now she was back for more. Nicky survived Hitler’s Germany. Her brother survived both Hitler and Stalin. Knowing something about the horrors of war she was ready to help. Our good friend Ned showed up a little later. Ned has military age children. 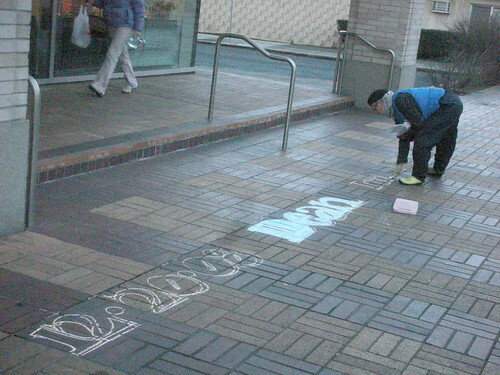 Here Ned is working on the date March 21st 2004. The first anniversary of the war. 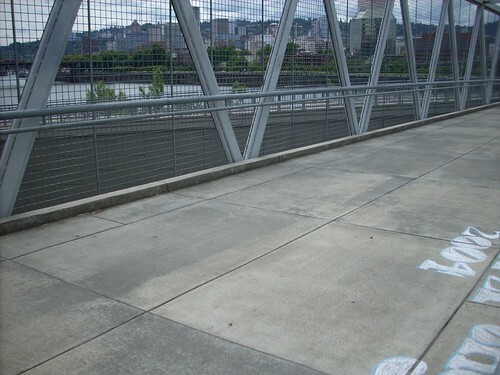 In the background on the left side of the Portland skyline that last pointy building you see is the KOIN Tower which is next to the Federal Building where Nancy Hiss started drawing names back on Memorial Day. 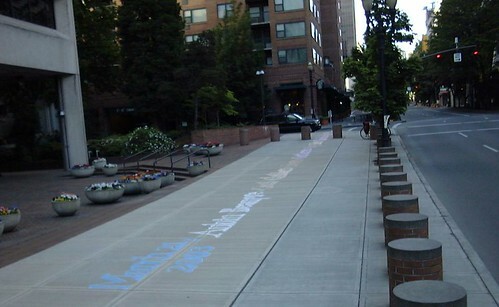 She has drawn a continuous line of names 2 miles at this point. 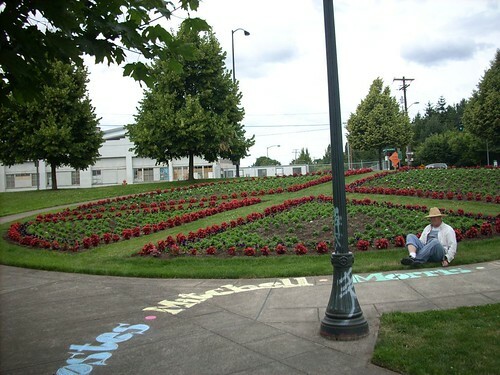 We had hoped to be at Peace Memorial Park on 4th of July, but we got there on June 23rd instead. 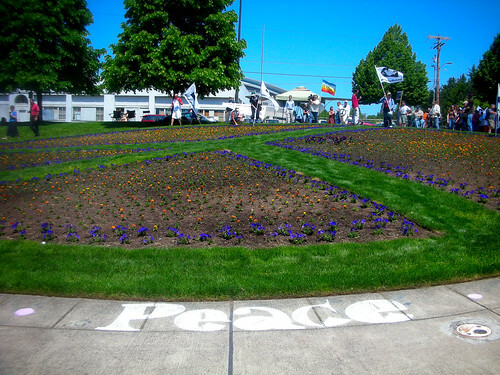 Peace Park is maintained by Veterans For Peace Chapter 72. 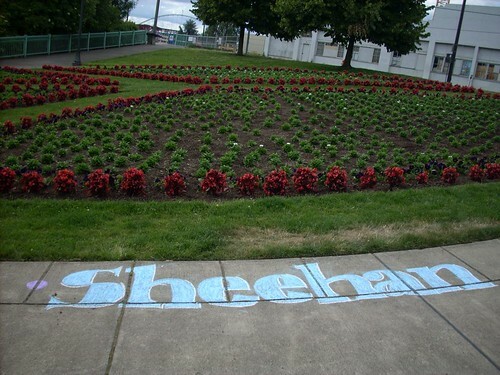 Some how it seems fitting that Casey Sheenhan’s name landed right there at Peace Memorial Park. Casey’s mom used to work with a great organization called Gold Star Families For Peace. 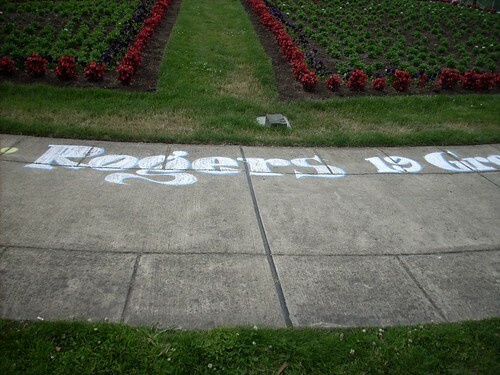 Philip Rogers or Gresham Oregon was 19 when he died. 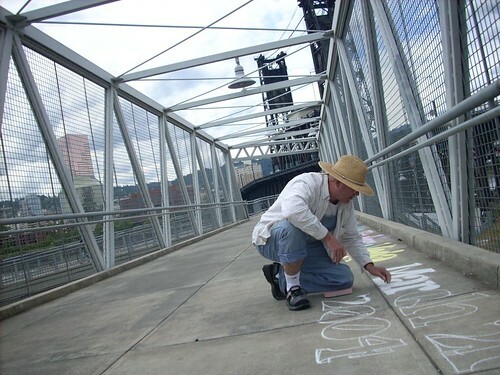 He loved to draw, not fight. Like many he joined the Army to get money for college. These folks did not stick around long enough for me to talk to them. 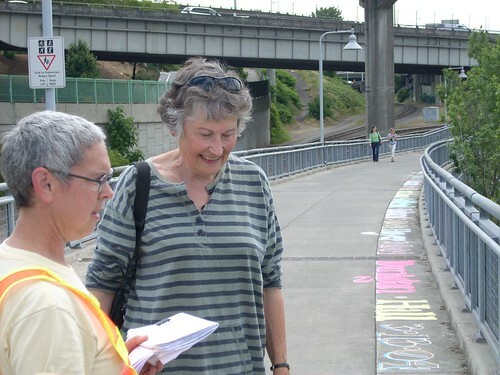 Nancy is talking to a member of Veterans For Peace. With him are his wife (I think) and Zahra Hamid Sultan. Ms Sultan is an Iraqi refugee living in Jordan. She speaks internationally on the blight of the nearly 2 million Iraqi refugees. Mike K from Veterans For Peace came down to help this morning. 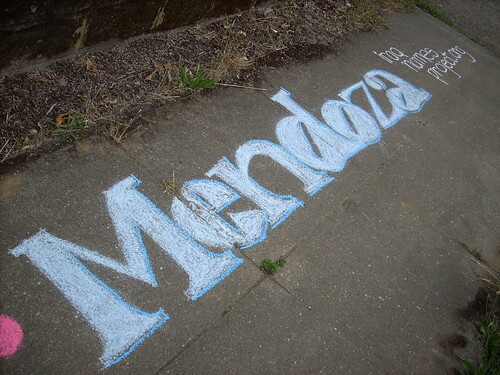 Nancy finished outlining Kennedy, Mike’s family name just as Mike walked up. 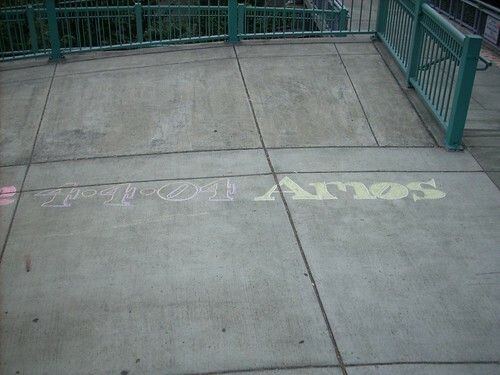 So Mike got to chalk his own name. Kyran E Kennedy lived on a farm in Hopkinsville Kentucky. Kyran was 43 years old when he was killed. He and his wife were originally from Boston’s West Roxbury neighborhood. They bought a farm in Hopkinsville where they were trying to live a sustainable lifestyle. They had a variety of animals, raised a garden and an orchard, and managed an ambitious beekeeping operation. He carried his dulcimer with him as he traveled around Iraq. The instrument was important to him and provided a sense of peace in the midst of the war, his wife Kathy told the AP. When he died his children, Christopher, Katie and Kevin, were ages 11,9 and 3. You are currently browsing the archives for the Veterans For Peace category.